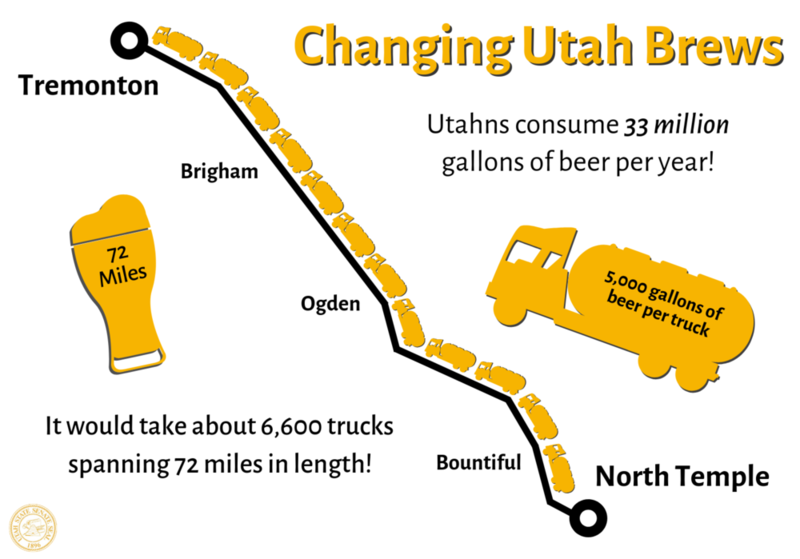 Utahns are likely familiar with beer sold in Utah having a lower alcohol content compared to some states. SB 132, sponsored by Sen. Jerry Stevenson, is looking to make amendments to Utah’s beer laws, and bring them more in line with the rest of the country for the benefit of Utah citizens and Utah’s economy. The increase, which is only marginal, would raise the by-weight percentage from 3.2 to 4.8 percent, and the by-volume percentage from 4 to 6 percent. As it stands, beer sold at grocery and convenience stores in Utah have a cap of 3.2 percent by weight and 4 percent by volume. Only 1.8 percent of all beer brewed in the U.S. has an alcohol content this low; Utah and Oklahoma being the primary consumers at 29 percent and 56 percent respectively. It’s becoming too cost-inefficient to produce such low-level beer; national breweries are phasing out the production of 3.2 percent beer as the market for it dries up. Similarly-restrictive laws in Colorado, Oklahoma and Kansas have or will likely change in the coming months. And, without legislation increasing the alcohol cap, “mom and pop” shops around the state would suffer as a result of the unavailability of the beer they count on for part of their revenue. SB 132 would not only help these establishments continue to function but offer more choice to Utah consumers with fewer limitations on the availability of beer in the marketplace. Ultimately, should the change from 3.2 percent to 4.8 percent occur, beer produced at the latter percentage would contain less than 1/2 tablespoon of additional alcohol per serving, and the top-75 selling beers would increase less than 1/10 tablespoon per 12 oz. serving. Realistically, not as significant in terms of consumption, but significant enough to matter to local breweries who are better able to manufacture and sell their product.